Hey everyone. I hope it has been a relaxing Thanksgiving for many of you. I have been tracking a very pesky low pressure system that will bring some snow and rain to the area tomorrow. The forecast models have not done a good job with this storm, much like the last nor’easter that busted for most of Philadelphia area. Every run has seen some sort of evolution with this storm. 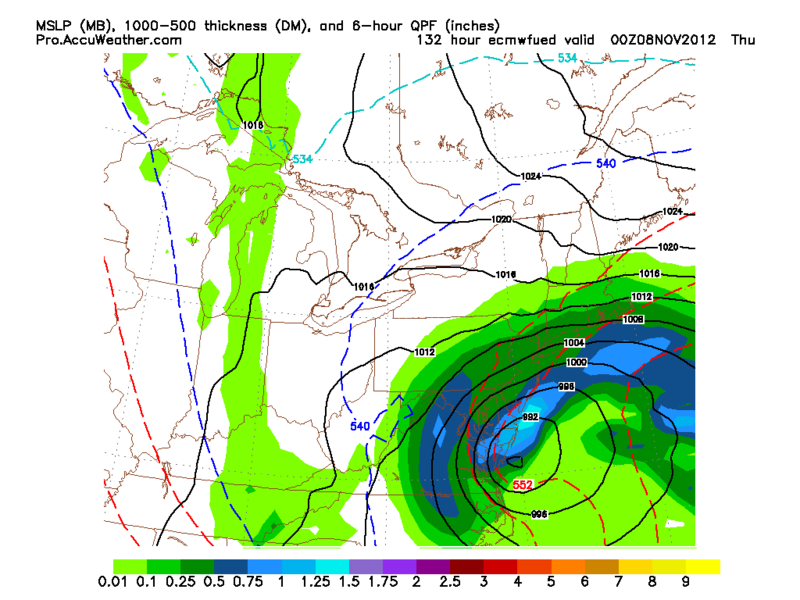 Last week, the prospects for a minor snowstorm seemed likely. But through the weekend, the forecast models started to lean away from the snowy solution, sliding the storm south and out to sea. However, the last few runs of the short range models have been forecasting a more aggressive system tomorrow. 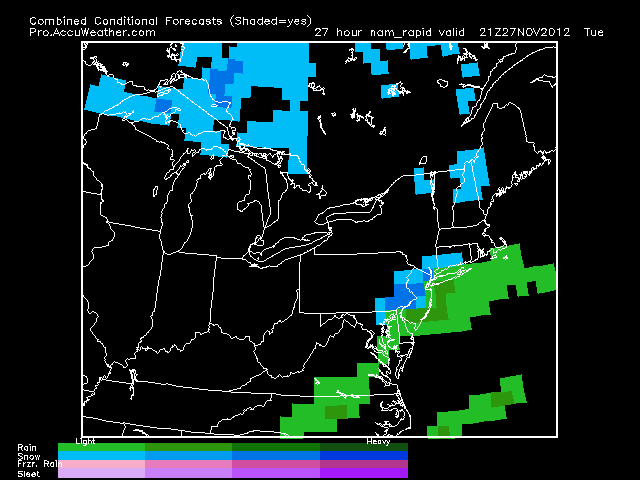 The NAM, in particular, has been showing a good 2-4 inches of snow falling just north and west of the city. I am sitting on the conservative side right now with this storm. It is still November and the ground is still fairly warm from the fall. I do not expect much accumulation on roads. Some sidewalks and driveways could be covered, especially if dynamic cooling occurs and the snow is falling at night. A wintry mix should start in the mid-morning and continue into the evening. At some point tomorrow, the mix could change to snow. The earlier the changeover, the more snow we receive. As you can see on the map below, at 4PM, the rain/snow line will be very close to the Philadelphia area. If this line moves south 10 miles, more snow will fall and more accumulation will occur. It has been a very polarizing day for the forecast models today. 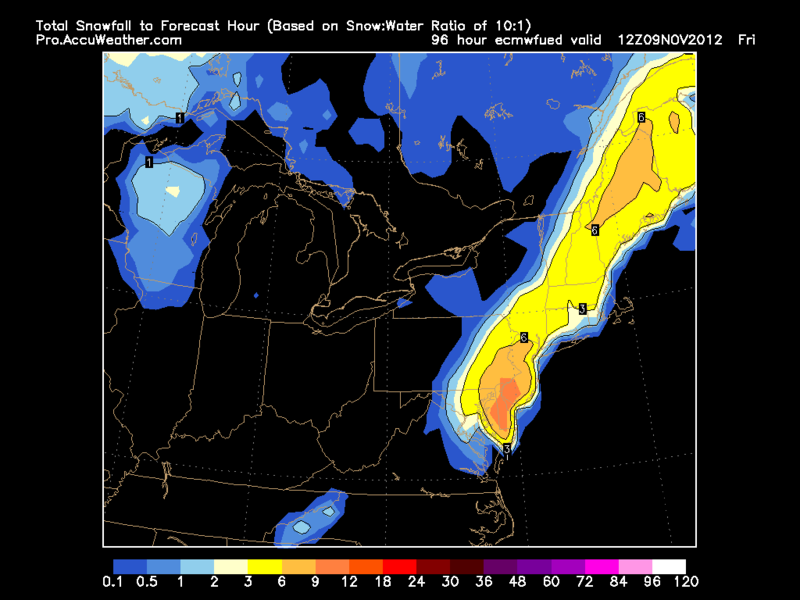 Last night, after I posted, all the models showed the storm heading out to sea, sparing the area of snow/wind. 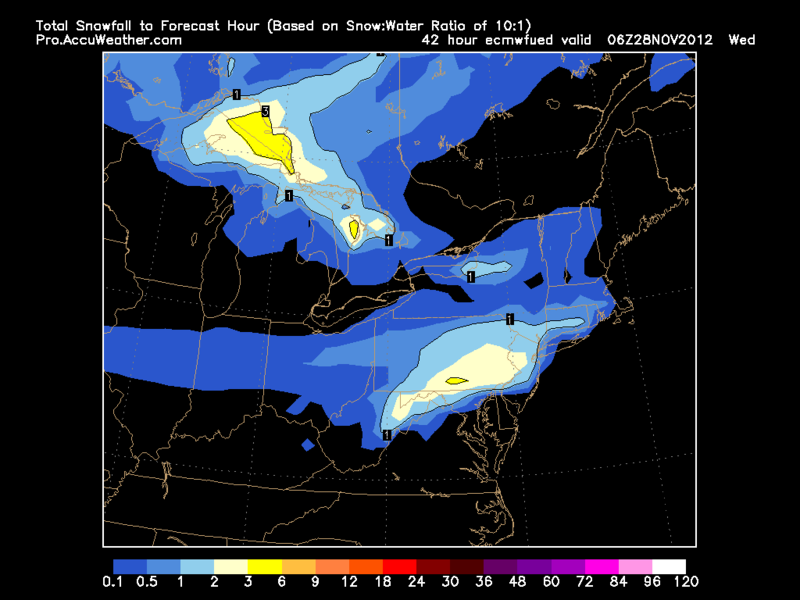 But, today the models have shifted west and many have been showing a fairly substantial snowstorm for the area. If you read my last post, scenario 1 looks to be the most likely and the one I am predicting. A piece of energy sitting off the North Carolina coast will phase with a negative trough and form a nor’easter. This nor’easter, from the influence of the trough, will stay close enough to the coast for precipitation to fall with heavy ne winds in our area. Even though surface temperatures will not start out at 32 degrees tomorrow afternoon, dynamic cooling will occur when the snow starts to fall. This is when cold air aloft comes down to the surface and lowers the temperature to near 32 degrees. The snow that falls will be very wet and heavy; large snowflakes. I am calling for a general 2-4 inches of snow to fall in the Philly area tomorrow. A few models have shown totals upward near 8-12 inches, but considering the time of year and snow ratio, totals should stay lower than what the models project. In north jersey and Catskills I called for 3-6 inches because of elevation. 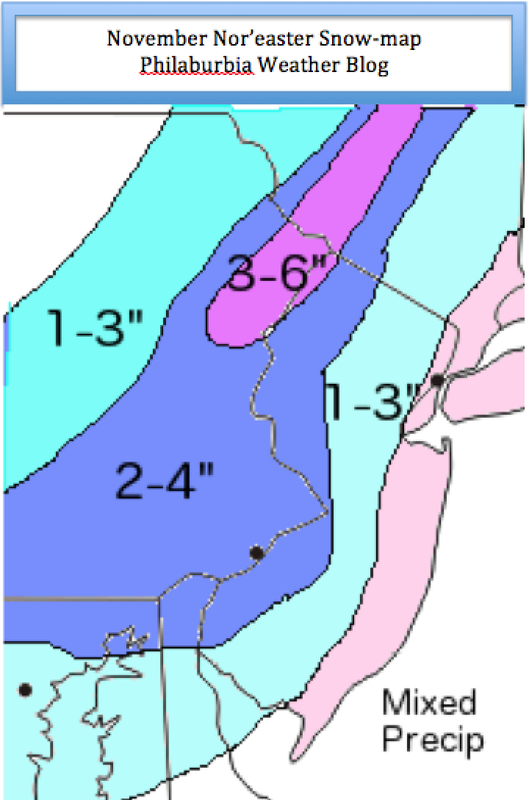 The shore and NYC should have a mix, which will keep their accumulations near zero. Of course things could change over the next 20 hours or so…so stay tuned. Much like the Halloween storm last year, wet heavy snow will fall with some trees still having leaves on their branches. As a result, widespread power outages could occur on Wednesday night/Thursday morning as the snow weighs down these trees and power lines. There will be a few school delays/closings Thursday. Because most roads will be snow free (it has been too warm recently to support much snow to stick on the roads), most schools will make the decision based off of how much damage the snow will cause. Hey everyone. Just as the area is starting to recover from Sandy, another powerful nor’easter is on its way on Wednesday into Thursday. Originally, I predicted that this storm would be a mainly wind and rain event. There was just not enough projected cold air aloft to support snowfall. But, over the past day or two, the forecast models have been trending toward a more Eastern and stronger scenario. A stronger and further East storm would pull in more cold air, giving us a major snowstorm. Yes, many of you might be thinking, “This cannot be happening. First a hurricane, now snow?” We are in a very brutal pattern right now. Fortunately, after this nor’easter passes on Wednesday, the weather will calm down for a while. There is so much uncertainty associated with this nor’easter. A shift of 20 miles east or west could change the forecast drastically. As of today, there are three possible scenarios. By tomorrow, I hope to make a final call and prediction for the storm. This scenario downright frightens me. Truly. I have seen the destruction from Sandy, and cannot imagine seeing more trees coming down and more power outages occurring. Unfortunately, this scenario is looking more and more likely as we get closer to Wednesday. The European forecast model is currently showing this scenario (note that the European projected Sandy correctly 9-10 days out, so we are dealing with very trustworthy data). The European brings the storm up the benchmark (100 or so miles east of NJ coast) and gives us 3-6 inches of wet, heavy snow. Much like last year’s Halloween snowstorm, this snow will create some major tree damage and widespread power outages. With both scenarios the wind will also be a factor. Our area is already under a High Wind Watch. Gusts will be near 50 mph inland and near 70 mph at the shore. 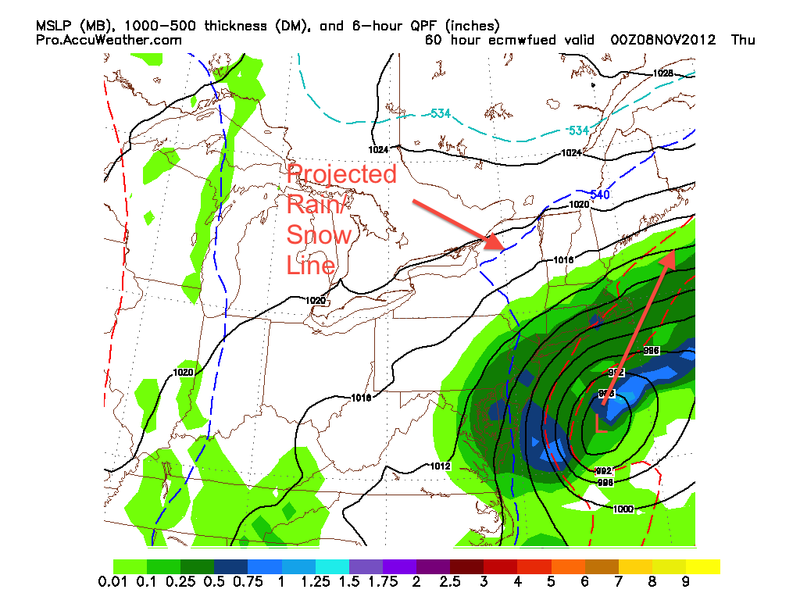 This scenario has been projected by the GFS and NAM model. 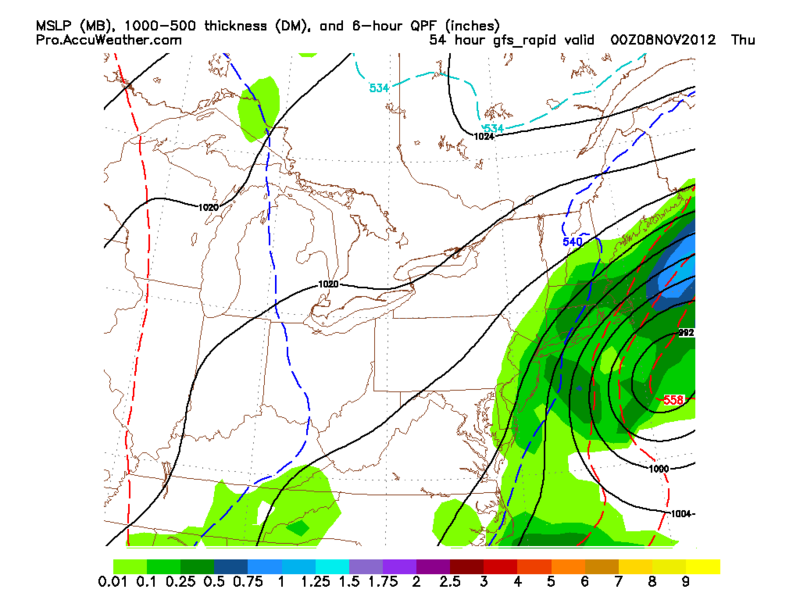 It shows the storm phasing with the trough a tiny bit later than the European model. With this scenario, we would have a period of light snow and some high winds before the storm pulls away. Because the storm would be further away from the area, its effects will be lessened quite a bit. As of right now, no forecast model is showing this solution. A few days ago, many were in consensus for a “coastal hugger” that would give Central PA and NY snow and our area heavy rain and wind. As of today, this scenario is unlikely, but still possible. I do not like to predict snow this early in the season, but as we saw last year, anything is possible. Right now I am leaning toward the European solution, as it has been the most reliable historically. Once again, I would start preparing as soon as you can for this storm. Make sure you have the necessities to last a few days in case of a power outage. Remember, it’s much better to be safe than sorry. It really has been an unfortunate week for millions of people along the East coast. Sandy caused over 100 billion dollars in damage and 98 deaths in the United States. Millions of people still remain without power and the Jersey shore has become uninhabitable in many places. It really is sad that weather can cause so much destruction and sorrow. I want to ensure people to keep their heads high. With all the support coming in from government and charity organizations, the Northeast will soon be back to the way it was pre-Sandy. I hate to be the bearer of bad news, especially when it comes to the weather. Unfortunately, we have another coastal storm coming next Wednesday. Luckily, this system will not be nearly as strong as Sandy. Like Sandy, it will primarily be a rain and wind maker. Even with the lack of cold air aloft and at the surface, the far NW suburbs could see some snow out of this system. Rainfall totals could reach 2 or 3 inches by the time the storm pulls away. Winds could also gust to 30 or 40 mph, especially along the coast. I will post additional entries if there is a change in the storm’s track or precip type as we head into next week.